There were at least nine bombs exploded around Khrungthep last night in two separate waves: one around 5:00 pm and another around midnight. Two people were killed and more than thirty were wounded including a foreigners whose leg was amputated by a blast at a seafood restaurant in the Phratumwan area. The first wave of six apparently coordinated explosions went off in the Sapahn Kwai and Victory Monument areas. The second wave included one near the famous backpacker hangout Khao San Road and two around the Central World Plaza area where a half-million people were expected to ring in the new year. After the first wave, the government urged people to stay home and most new year’s celebrations were canceled and stores closed several hours early. Tawn reports that the restaurant he and his parents and his parents’ guests ate at had suffered multiple reservation cancelations. 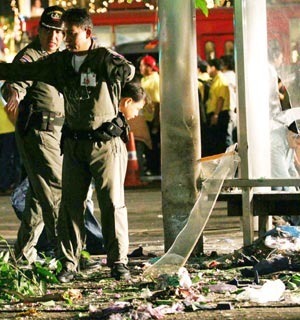 The government came out shortly after the blasts and claimed that the bombs were the work of supporters of deposed Prime Minister Thaksin Shinawatra, and were not linked to muslim separatists in the south, where bombings and other violence have been a nearly daily occurrence. The evidence for the government’s claim that the separatists are not behind this is that the types of bombs used, mostly improvised explosive devices set off by mobile phone and grenades, are not typical of what the separatists have used. Assuming it is true, that would seem a logical conclusion. It also has the benefit of deflecting any global attention to Thailand as being the next battleground in Islamic extremism. By pointing the finger at their political opponents, the government has an opportunity to take measures to strengthen its position, especially in light of what has been a week full of verbal attacks by the anti-coup forces including claims that General Sonthi, the leader of the coup, has two wives, and that the interim Prime Minister Surayod’s home in the north of the country is on government land that was acquired illegally. If the coup government is to retain power, they will likely take more extreme measures including the possible re-implementation of martial law. Otherwise, we may have a counter-coup sooner rather than later. In general, travel to Thailand is still very safe. The likelihood of being involved in an incident is minimal and it is unclear whether these bombs were an isolated event or something that will continue. Markus and Tam came over for dinner last night and we made spinach, mushroom and Italian sausage lasagna – a combination I absolutely love – and a very large green salad. The homemade croissants were featured, pictures in a minute, and for dessert we had apple cinamon tarts and lemon pound cake (both homemade). Markus was still jet-lagged from his return from the US the day before, Tam was tired from working early in the morning and he had an early morning on the first, and I was tired from the 35-km bike ride Markus and I took that morning in Min Buri. So we wrapped up the evening by eleven, before Markus fell asleep on the couch. Tawn returned home from dinner with his parents and their Italian guests by about 11:20 and we were in bed and asleep a bit before midnight. Such a bunch of old fogeys. 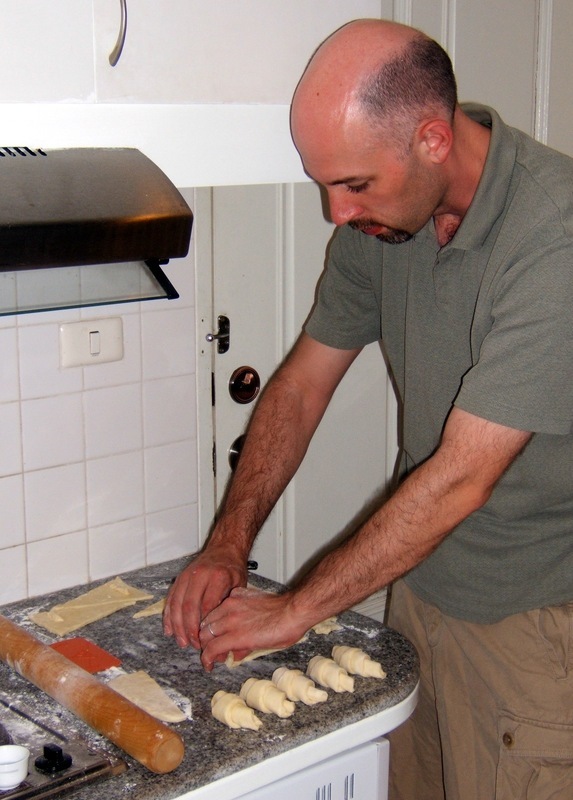 Left: Rolling out the dough, one step in the lengthy process that involved rolling out the dough, folding it like a letter, turning it ninety degrees and rolling and folding again. 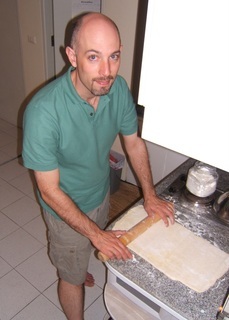 Then the dough would be chilled and allowed to rise in the refrigerator, then repeat the rolling and folding process a total of four times. 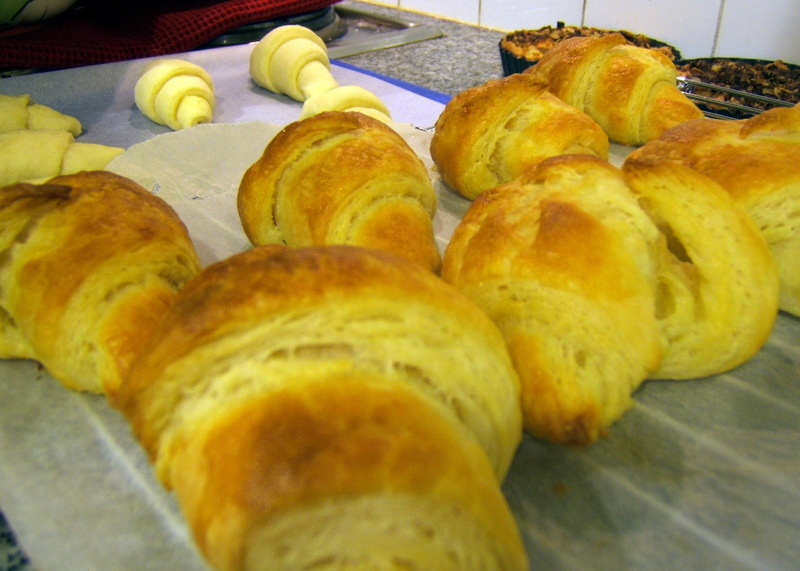 The croissants turned out well, the texture was perfect, very light and flakey. I think I made them a little small and so the next batch will be rolled out physically larger. The odd thing, and I went back and checked the recipe on this, was that they tasted very bland; not enough salt. I put in one teaspoon as per the recipe and used unsalted butter, following Wolfgang’s instructions, but they really needed a bit of salt to bring out the flavor. 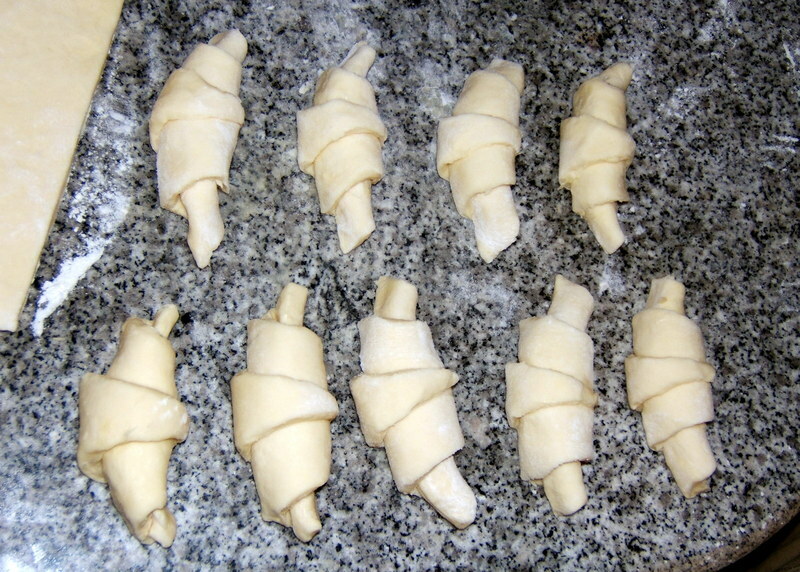 I also tried freezing some of the croissants: a few that were unbaked but rolled to see if they can be baked from frozen and turn out okay, as well as a few baked ones that were immediately frozen to see if they can later be heated up. 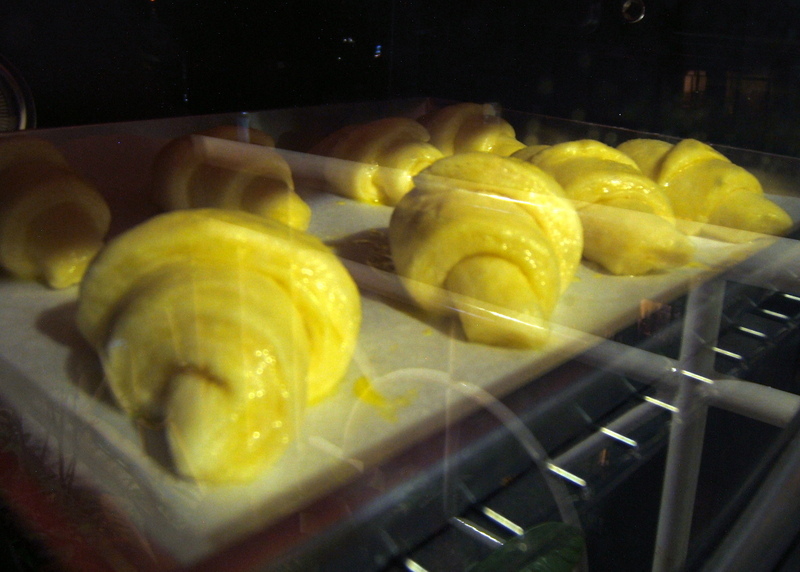 Will these frozen croissants produce the same fresh-baked results? We’ll see. Above: The finished results. They look real, right? There have been a number of bombings throughout the city, although all of them “low scale” in terms of relative damage. There has been one confirmed death and a dozen or so injuries. Police are on high alert and are discussing the possibility of shutting down the New Year’s festivities. I am at home with Tam and Markus. Tawn is out with his parents having dinner but will return home well before midnight. They are okay. Yesterday Tawn and I met Peter and Andrew for dinner over at Cafe de Laos. It was really nice visiting with them and afterwards Peter, Tawn and I had a drink at the “Triple 2” botique hotel on Silom. Of course even though I broght my camera along I forgot to take a picture. This morning I woke up at six… why?… and worked on my trip reports from Novembers flights to Melbourne and back. If you’d like to read them, part 1 is here and part 2 is here. 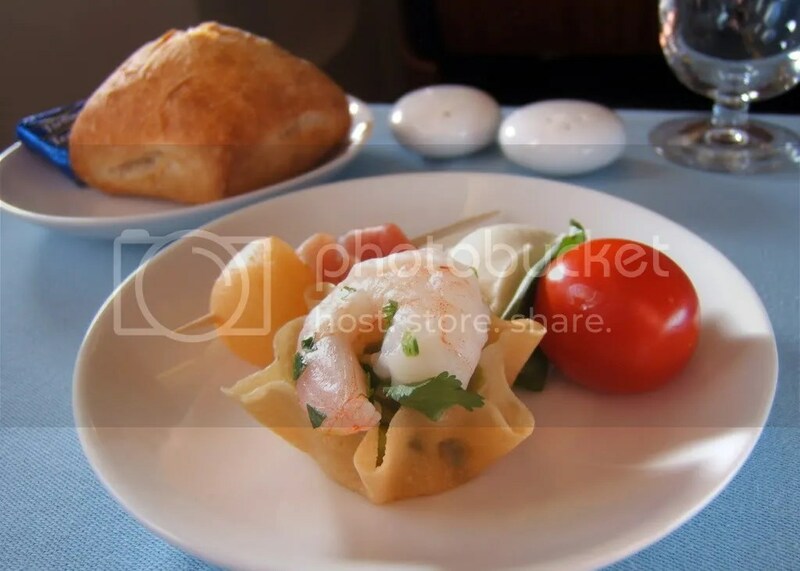 The picture here is of the amuse bush offered on Austrian Airlines’ Melbourne to Singapore flight. Today I think I’m going to attempt the culinary equivalent of scaling K-2: making croissants. Tawn’s request. 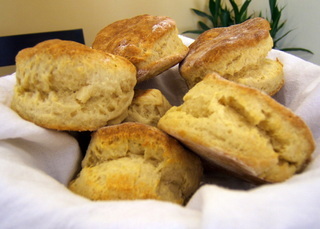 The recipe has several steps that stretch over two days. We’ll see how it goes. Stay tuned. 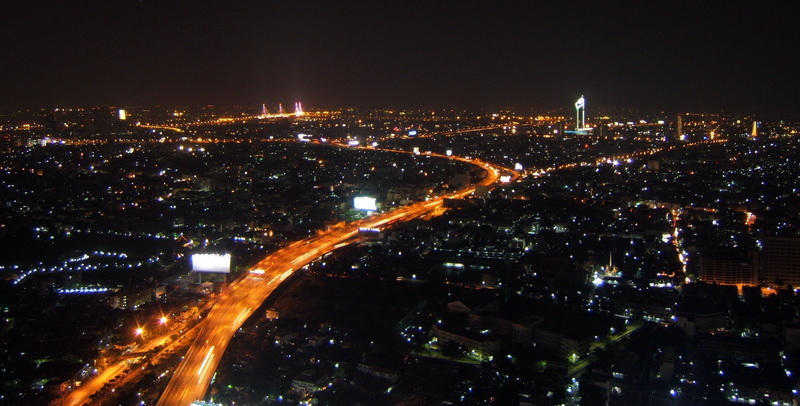 Above: Khrungthep at night looking south towards the Kasikorn Bank headquarters (white outlined building to the right of center) and the new mega-bridge project (pink towers to left of center on horizon). In the evening we met up with Peter and Teh. Peter’s in town from Penang on his way back to Shanghai and Teh is a Penang native. We started out at Scirocco on the 64th floor of the State Tower, one of two skyscraper rooftop bars and restaurants in the Big Mango, the other being Vertigo at the Banyan Tree. Our timing was quite good as we arrived just after sunset so the sky was still a nice color. Right: Teh, Tawn and Peter in front of the golden dome at Scirocco. Our visit was really nice and after a few drinks and running in to Tawn’s friend Kathy (whose sunset wedding on the beach in Phuket we went to in September) and her husband Dan, just back in town from Koh Chang and on their way home to Hong Kong. I took one look at Kathy and new what she was about to tell Tawn: sure enough, she’s expecting! Very good news. After dinner we took at cab to Yaworat – Chinatown – and ate seafood at one of the street-side restaurants that magically appear after the sun goes down and the normal businesses close. The salted baked whitefish and the grilled prawns are fantastic. Left: Chris and Peter eating on the street in Chinatown. 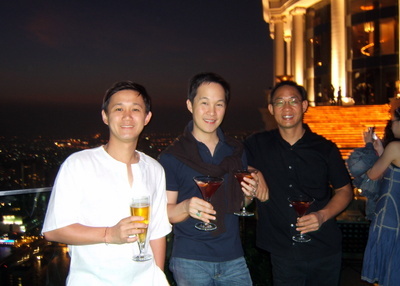 Below: Tawn and Teh with Thanon Charoen Khrung right behind them. 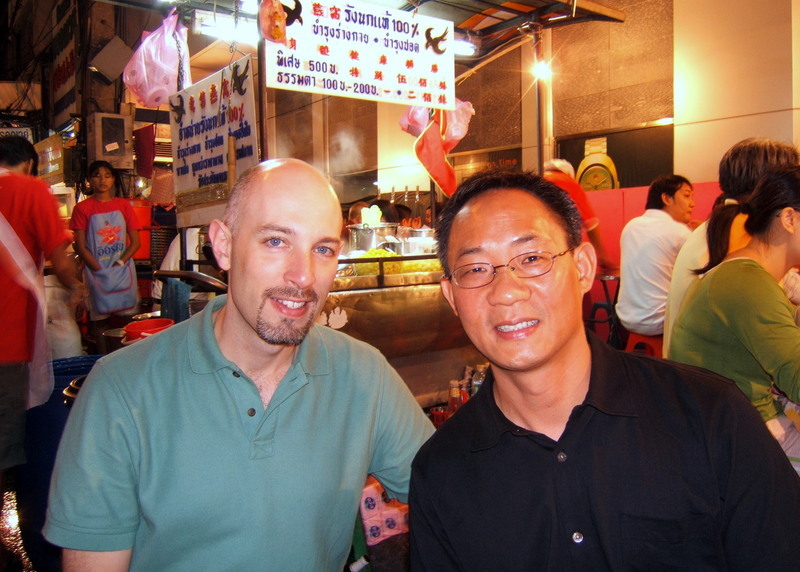 Peter and Teh will be heading home on Monday morning so we may not see them again, but Shanghai and Penang are both on our list of “would like to go to” destinations. I received news that my Grandfather has been moved to a skilled rehab facility to help him with recover from his broken hip and shattered right elbow. Grandma reports that both a physical therapist and an occupational therapist (huh? he’s retired!) have already been in to work with him and that he is in good spirits with little pain. As of 5:00 pm I’ve spent the entire day in front of the computer working on a training presentation. Thankfully it is Friday and we have dinner plans with visiting friends this evening. So in what is ostensibly just a trip to San Francisco and Kansas City, we’ve managed through some creative routing to build in mini-visits to Japan, Toronto and Hong Kong! Plus we get to try Air Canada’s nonstop Toronto-Hong Kong service, which is their equivalent of the Singapore Airlines New York-Singapore or THAI’s New York-Bangkok. It is possibly true of life anywhere, but life in Thailand seems especially full of contradictions: walking down the street past a company that sells tanks of oxygen (dozens of them standing upright, unrestrained) with a shrine in the midst of the room full of full tanks, three candles ablaze for good fortune, for example. Their fortune must be holding out as there have been no explosions and fires yet. 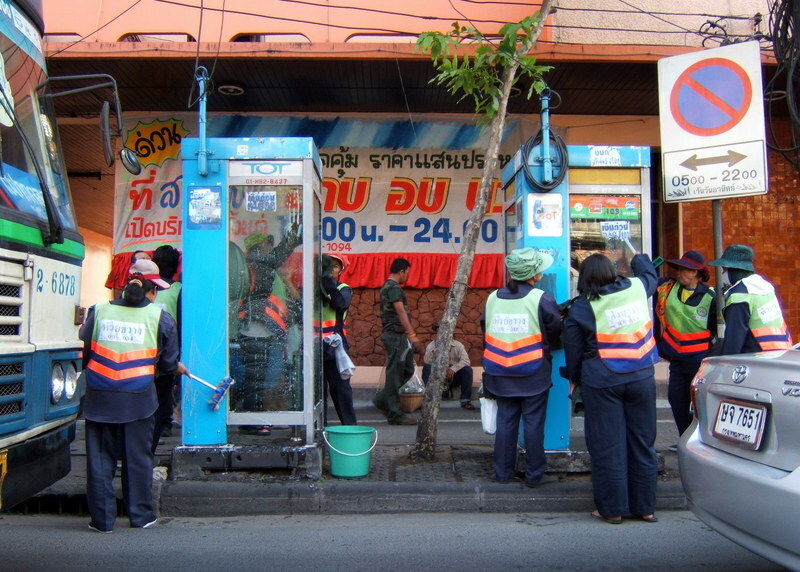 Sitting in traffic on a major street outside one of the most modern office buildings in all of Southeast Asia, there is a team of street cleaners: middle-aged women in heavy protective clothing with buckets of cleaning supplies, walking down the street cleaning phone booths, sweeping gutters, and removing posters. 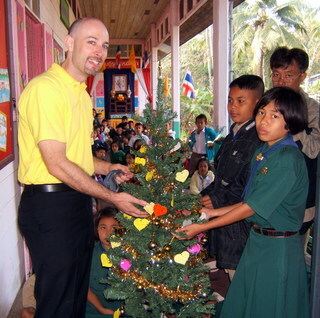 And then there’s Christmas at Bangkhonthiinai, the all-Buddhist school where I teach. 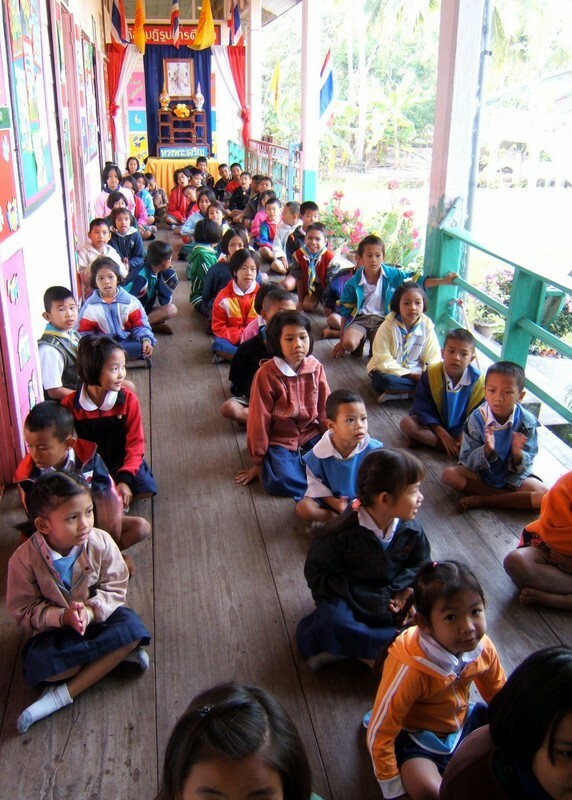 When I arrived this morning, it was a bit chilly and the children were sitting in rows on the porch area having just finished their chanting and awaiting my arrival. They were all bundled up in their winter wear! There was a small artificial Christmas tree set up on the porch with twinkling lights, decorated with small paper hearts. On closer inspection each heart had a hand written message from a student. One of the students made a presentation to me in Thai, thanking me for my hard work and generosity in teaching them English this year and wishing me a Merry Christmas and a Happy New Year. When I asked if she would like to try repeating all that in English, she smiled and declined the offer. Then she and another student officially gave me the Christmas Tree, khruu Somchai insisting that we pose like they were actually handing the tree to me. After lunch, Ajarn Yai and the teachers presented me with Christmas gifts (as well as one for Tod, which I’ll deliver when he returns from Chiang Mai): very nice porcelain bowls called ben jarong – a particular type of porcelain painted with five different colours. Very beautiful. During the day, a number of different students presented me with Christmas gifts. I’ve made careful note of who gave me what gift so I can write proper thank-you notes. Gifts were very sweet, mostly candles and soaps along with a bunny rabbit washcloth. I’m thinking perhaps there’s a subtle (or not so subtle) message that I need to wear more deodorant! What was especially cute was the way that gifts were wrapped: they used whatever boxes they could find (one was in a throat lozenge box!) and included the creative use of rubber bands by one students who perhaps had no cellophane tape at home. It was really touching and I think I’ll have to be teaching there for the rest of my life now. At the end of the day, Ajarn Yai insisted that I take the tree home. I had really thought it was just a symbolic giving of it to me, not a literal one. So when Tawn arrived home from work this evening, he was treated to a Christmas tree in our living room. Okay, Santa must be playing some horrid joke here: On Christmas day when I pulled into the car park at Tawn’s office, I had the window rolled down and could smell coolant fluid burning. Sure enough, when I parked and got out, there was a quickly-forming pool of coolant as it leaked out from the radiator. Popping the hood – actually the first time in a year that I’ve looked under the hood of Tawn’s Nissan – I could see coolant coming from the top of the radiator, but not from the area around the cap. So Tuesday morning, the second day of Christmas, I canceled my Thai lesson and drove the car back over to the Nissan dealership (second time in, what, a week?) on Sukhumvit Soi 71. Worst fears confirmed, foreshadowed by a statement the mechanic had made on my last visit that the radiator was nearing the end of its useful life, the radiator did need to be replaced. All I can say is, thank goodness we didn’t get the really expensive microwave/convection combo oven. Questions, though: do cooling systems tend to wear out faster in cars that drive largely in stop-and-go (or in Khrungthep, stop-and-stay-stopped) traffic? His car is about eleven years old and only has about 88,000 km (52,000 miles) so it has definitely seen a lot of city driving. It makes sense to me that the cooling system would wear out faster because at highway speeds you get some help with the cooling just by the increased airflow. Thank you to the well-wishers who have expressed their thoughts for my grandfather’s speedy recovery. He underwent a five-hour surgery on Christmas morning to repair the damage to his right elbow, requiring thirteen screws to be inserted along with a pair of metal plates. The doctor is optimistic that he will recover well, but is at best expecting about 50% mobility in the right elbow. The two to three month recovery will be impeded by the healing of his broken right hip, or more precisely the bone that hip joint rests in. (Maybe am not getting the explanation right – is there a doctor in the house?) Normally, the recovery from that would involve physical therapy with the use of a walker but with the arm injury, a walker won’t be as useful. My grandmother, a retired nurse, is expecting a very long few months of some very painful physical therapy. But I think my grandfather has a great deal of fortitude and will find the strength to get through it. I do wish I was there to be able to help around the house, though. One of the problems of living far away from your family. Christmas arrived just a hair early this year. After living for more than a year without an oven, a situation that those of you who know me personally will appreciate to be almost inconcievable, I am once again with oven thanks to a thoughtful Christams and thank-you gift from my parents. Perhaps they sensed some low-frequency field of energy that emanates from a person who hasn’t had access to an oven in a long time. Someone deprived of freshly-baked pies, cookies, breads, and biscuits. Or maybe they just knew. Parents are like that. Thank goodness we opened the card two days before the party! 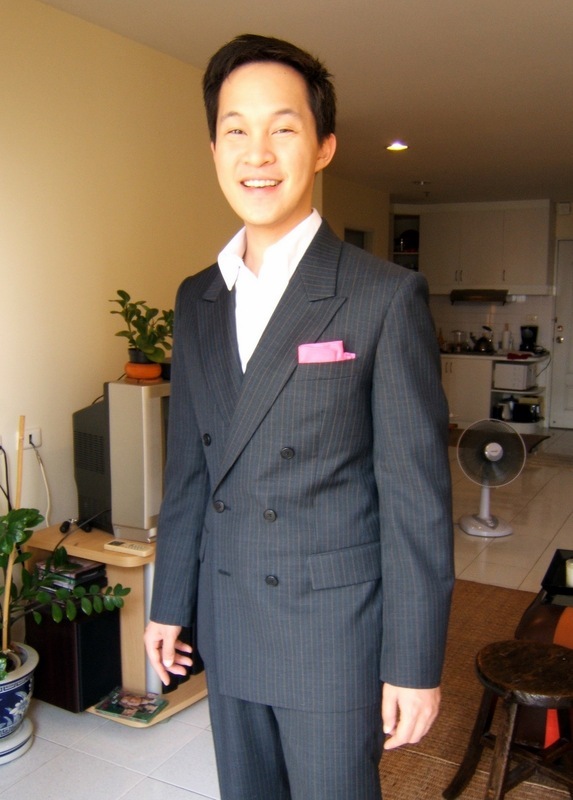 Right: Tawn with his new suit from Tony’s Suits – multiple hours of shopping. Most of Saturday was spent shopping for the oven. We arrived at Central Chidlom bright and early, 9:45, and secured a prime parking space. The challenge here is that different stores carry different brands. So the ovens at Central were different from the ones at Paragon and Emporium (which are different stores owned by the same company). But the selection at Paragon was different than at Emporium. Thankfully we could just leave the car parked at Central and take the BTS Skytrain up and down Sukhumvit Road to comparison shop at four different shopping centers! Tawn’s mother had the day free since Tawn’s father had a reunion to go to (“An old man’s party” is how Khun Nui described it with a frown) and joined us at Emporium. We also had lunch scheduled with Masakazu, who was in town for just three days after an entire month of flying out of Tokyo Narita for United. We brought Khun Nui to the lunch, which probably was a mess for Masa but he’s much to polite to ever let that show. 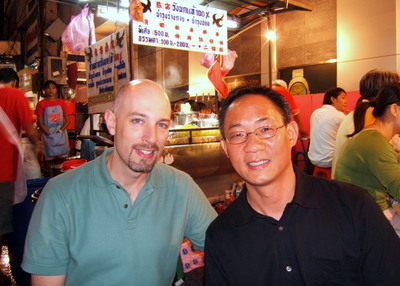 Fortunately, though, he speaks Thai fairly well so we did okay with a blended Thai-English conversation. An additional shopping challenge, one that I’ve experienced in the United States as well, is when the salespeople don’t know anything about the products they sell. None of the salespeople had ever baked anything in an oven, so they were able to read the stickers and say with great sincerity that the most expensive models were the best. Finally, the lady who works at the Verasu section of Paragon (Verasu is an independent kitchen retailer who, in addition to their retail store on Wireless Road, sells in both Paragon and Emporium) was able to speak more competently about ovens. Ironically, or not as the case may be, we ended up buying the very oven (from Severin, a Danish manufacturer) that we had seen several weeks ago when browsing ovens. Not the most expensive model, it was in fact quite modestly priced. It is only a convection oven, not a combination convection / microwave / steamer / toaster that everyone else was pushing. And while the fan is in the side panel, not the rear like a “true” convection oven, it seemed to be the best option. Plus, it has a rotisserie so I can cook large chunks of meat. The next challenge was where to put it. 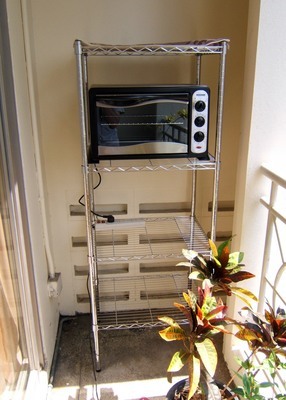 No room inside the house so we bought some wire shelving from Home Pro and set it up on the balcony. We’ll need to come up with an appropriate cover to keep it out of the weather, but I think it should be fine there. Notice the electrical conduit on the wall to the left of the rack. No outlet yet; need to have that installed by the handyman. So our first couple of baking experiences included running an extension cord through the sliding patio doors and into the living room. Thankfully the weather is cool. Buttermilk biscuits seemed a suitable test for the oven and our first batch came out light and flakey, thanks to a downwards adjustment in temperature, unlike the hockey puck versions that I cooked at Tam and Markus’ house. A convection oven takes some getting used to as with the fan it circulates the heat more efficiently than in a conventional oven so cooking times are usually shorter and the temperature has to be lowered about 25-50 F.
For our Christmas Eve party, which had a dozen guests – a few more than originally expected – the oven came into great use for two flourless chocolate cakes. A bit drier than ideal but tasty, although I neglected to purchase any rasperries to make a coulis with. Let’s talk about that party, shall we? What was originally going to be a smaller gathering of just a few couples continued to grow as more people were invited. Then on Saturday, just as we started our oven shopping, we ran into Suwandi, someone I knew from San Francisco, a full decade ago. So we invited him and Yuen Ping, who was visiting from Singapore. And this invitation eventually included Peter (in from Penang) and his friend Teh, who I had previously invited as I knew they were in town but they had originally declined since they had other dinner plans. Having drinks with Yuen Ping several months ago, he mentioned that Sunwandi came to Khrungthep from time to time. Since I knew this, I wasn’t at all surprised when Tawn and I ran into him. Still, there is the awkwardness of meeting someone whom you haven’t seen in a decade and with whom you’ve had no contact in nearly as long. What do you say to a friend who has evaporated from your life? Which gets me to thinking, what obligation do people have to stay in touch with each other in order to maintain a friendship? Certainly, this blog aside, I’ve done a pretty poor job of staying in touch with many friends over the years. At the same time, even though the contact is infrequent, I try to reconnect with friends at least once or twice a year. Postcards and letters are one of the ways I try to stay in touch; Stuart mentioned that this year I was the only person to actually send him an “analog” birthday card. Where is the point, though, where you decide that someone has not made sufficient effort to stay in touch and you finally erase them from your address book? This week I’ve been working on a project to update my address book and in the process I’ve realized that I don’t erase people very readily from my address book. There are many people in there with whom I’m been out of touch for years and I’d like to think that if we were to get back in touch that we’d be able to pick up where we left off and resume our friendship. To me, that’s the essence of a friendship: the seed of it can remain fertile, if dormant, until it is once again given the opportunity to blossom. The party ended up being thirteen people including Tawn and me, which taxed my food-preparation capabilities. Partially because I chose a meal that wasn’t really large group/small kitchen friendly: risotto. The pumpkin risotto sounded like a good idea and it was tasty enough, but keeping it in the oven between preparation and serving resulted in more of a “baked rice” dish than I desired. Also, owing to a small stock pot, the carrot soup was not as thin as I thought it should be. The flavor was good but the consistency was more like a carrot puree. One of the guests commented that it looked like baby food. While this may be true, I’m not sure Miss Manners would approve of making that sort of comment. Left: Baby food… err, carrot soup, served in a collection of small cups and garnished with roasted pepper, sour cream, and parsley. Which brings up another question: Which manners transcend cultures? Surely there are some things that just simply are poor manners regardless of where you are or what culture you’re in. The greatest benefit of the party was that afterwards, Tawn and I were able to have a really good conversation about what’s important to us, setting aside all of the emotions and tensions that such an event can give rise to. Both of us are perfectionists, although we focus our energies in different areas: Tawn is concerned about the house being spotlessly clean and meticulously arranged, with an eye to presentation (see the picture above! 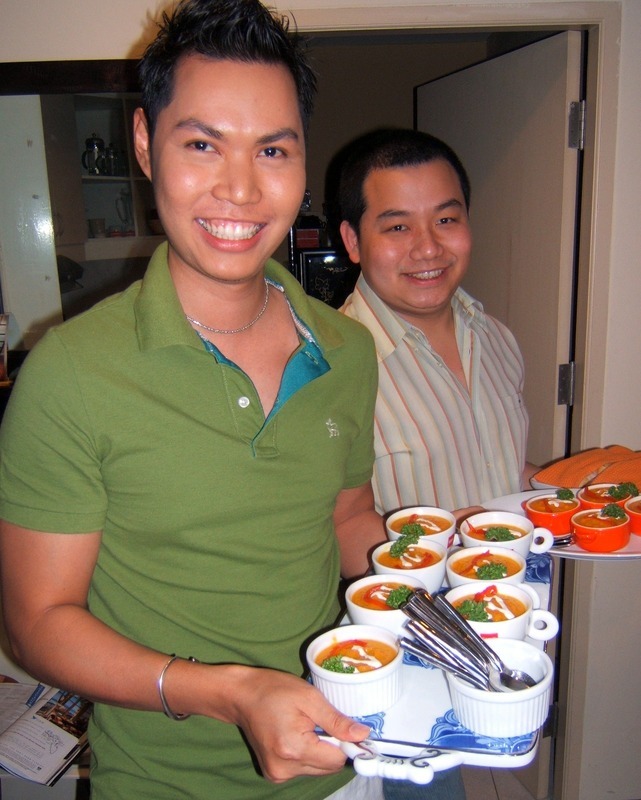 ), whereas I’m concerned about the food and beverages being well thought-out, tasty, and attentively prepared. And with ingredients that are unnecessarily expensive, I’ll admit. I want guests to say, “what incredible food” while Tawn wants guests to say, “what an incredible place setting and centerpiece!” Both are reasonable goals, but they can cause conflict since neither of us fully appreciates why the other puts so much energy in their respective area. So we had a really good conversation after the meal and now share a better understanding of what we can both do to put less energy into parties and dinners and get more enjoyment out. As you might imagine, it boils down to communication about expectations. That, and both of us ratcheting down our perfectionist streaks and allowing “lower-key” to be okay. 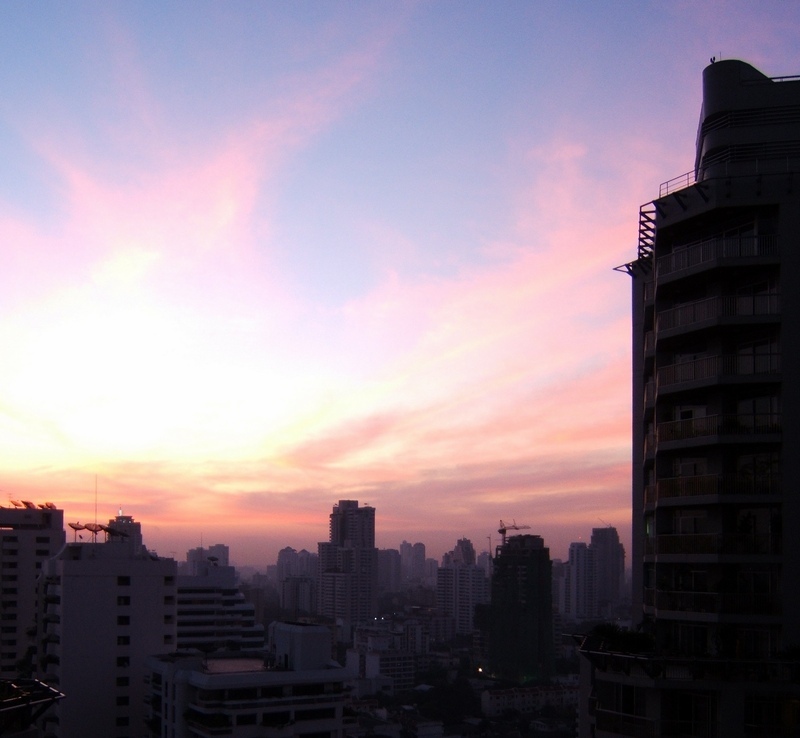 It is now Christmas morning, a normal workday here in Thailand where less than one percent of the population is Christian. I called my family a little while ago at my grandparents’ house only to learn that my grandfather had fallen yesterday on a friend’s basement steps and is in the hospital with a shattered right elbow and a broken hip bone, awaiting surgery on Christmas day to implant a metal brace in the elbow. Thankfully, no neurological or spinal injury and he reports no significant pain. Your thoughts and prayers are appreciated. Happy holidays to all and wishes of peace and good health for the new year.